Compositing images is nothing new. It was a fairly simple procedure back when folks used film, and it’s a very simple job to do so now with programs like Photoshop. 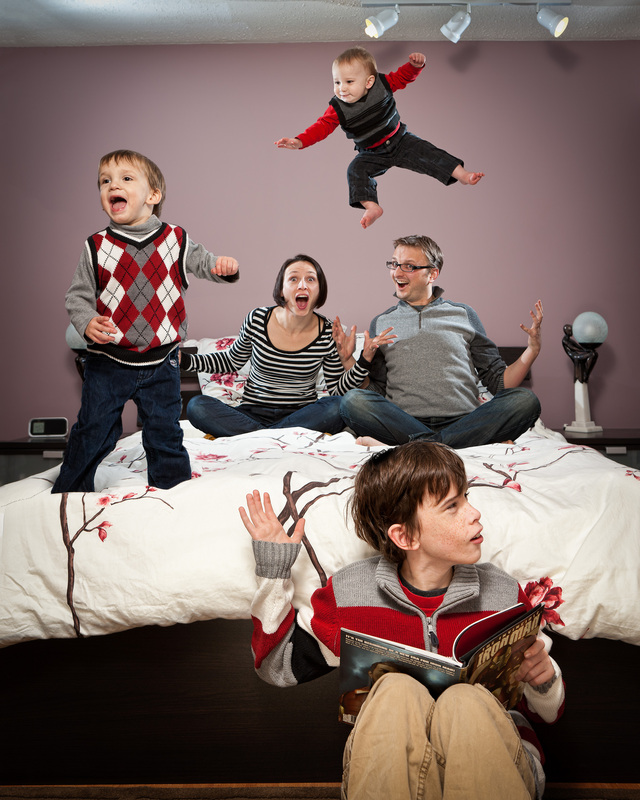 That’s how I took the photo of my family this year: I composited several different images into one single photograph. This wasn’t my first attempt either, though I don’t use the technique often I did give it a go a few years ago when I first started visiting Ottawa. The variables were simpler then: two me’s and a stationary subject. 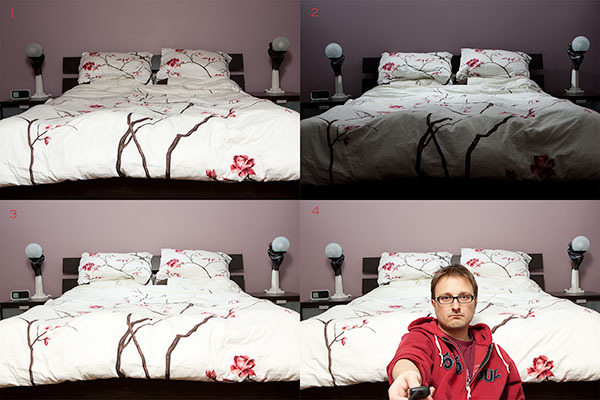 The method is dead simple: keep your camera still, your settings the same, take multiple exposures: blend until done. 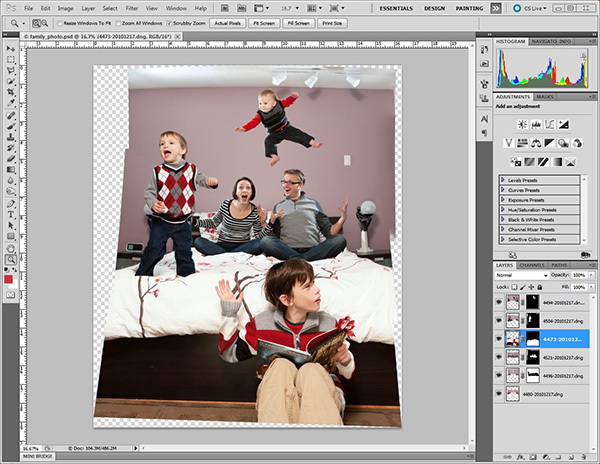 This time I’d be taking our entire family and throwing them into a photograph, literally. An important first step is planning. If you’re going to be layering a bunch of images on top of each other – you’d better have a plan. Otherwise I’d have everyone in front of everyone, no easy way to blend the images together, and it’d all be a bust – or at least very difficult. Everything has to be stationary. I mean, if you’re a photoshop wizard you can just take one photo from one source and drop it in another, but that’s not how I roll and I need things to be a bit easier. So for this image I already had the plan of how (loosely) my family would fit into the image, and all I needed was to light it appropriately, and lock my camera on a tripod to make sure it didn’t move an inch. Once I composed the frame and locked my camera down, I taped the lens’ focus & zoom rings with some Gaffer’s tape to make sure the focal length didn’t change. Another important aspect, for any image, is light. I’m very interested in creating a dynamic lighting situation whenever I take a photograph. In the case of my family, I wanted it to be even throughout the frame; this wasn’t about drama in the lighting – it was about making sure everyone had light on their faces and that the light was consistent for Photoshop. Here I used a Quadra Ranger on the “B” setting (the “B” port allows for a much faster flash duration, which is better for capturing motion, like Alex flying through the scene) as my main light. 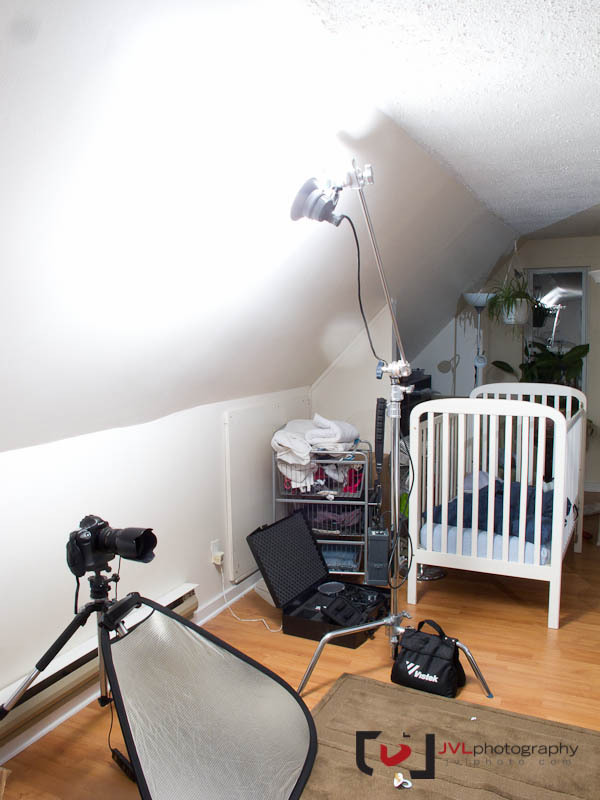 I bounced it off my conveniently angled cieling to give us a pretty even spread of light. Below is the image with the Quadra flash head poping. I then needed to even out the setting, because of the depth of the image, I didn’t want Owen (at front) to be the “highlight” of the entire image – I needed to light us parents at the back too! Since the Quadra was doing all the heavy lifting, I just needed to add a few Canon 580exII’s at either side (and high) to the bed to illuminate the rear of the frame and, as a bonus, added some separation to any subjects it would hit the back of. Owen is my step-son, and he’s only here every other week. It was his dad’s night to have him and so he was the first we shot. I sat him down in front of the setup and popped off a few dozen images. Since he was first, it’s important to lock down any adjustments I may have needed to make (I didn’t need to make any) because everything I do for him, I should do for every other image. Alex was next, Quinn was having a nap, and we were fortunate to have a few guests over so that we could toss him accross the bed as I snapped the frames. It took a few tries before the ladies were comfortable giving him the distance he needed so that he would be “cleanly” in the air without being blocked by their arms. For this image I had to carefully pan the camera up to capture the ceiling while keeping on the same axis as the first image – if I was too far to the left or right, I’d be missing a big chunk in my final composite. I’d later lower it a bit to capture the “middle” of the image for Quinn, Me, Mel and complete the 3 image pan. We followed up with Quinn, who was the hardest to deal with. The idea was to have him jump on the bed and, while he’s more than eager to accomodate that when we don’t want him to do it, he was hesitant to oblige us by this request. I only got a half-dozen frames before he gave up and started to investigate my camera equipment. So I had what I had. Finally it was me & Mel. 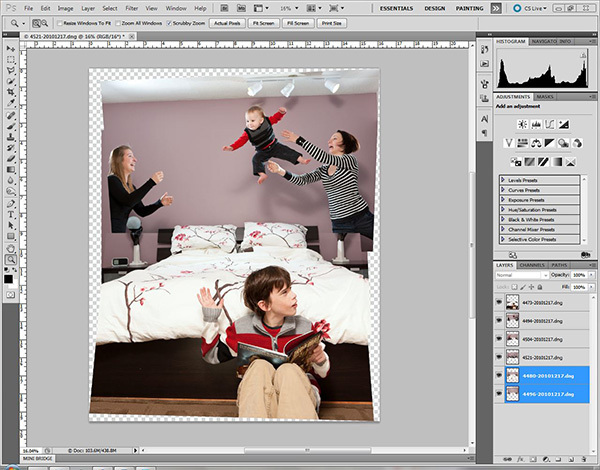 The trick here, now, is that we know we’ve layered the kids on parts on and around the bed, but we’re not sure WHICH images we’re going to use yet, and we don’t know exactly where the overlap will be. Overlap will be trickier to deal with later, in Photoshop. Why go through the trouble of a composite? It’s a challenge, it’s a bit different, gives us some depth and, as I learned when taking this image, you have a better chance of working with your kids and choosing the best of a series. The alternative is get everyone in front of the camera and, maybe, there’s one perfect image where you’re all smiling and happy and nobody’s blinking, crying, hitting, or walking away. Not likely. I do this with group photos for corporations and at events like weddings. too. I picked and culled the “best” photos based on expressions and placement in Lightroom, selected the images, including a few safety “scene” images – then did all my edits equally on the images (this makes sure I didn’t make one too bright, or too blue etc) and went to Photo/Edit in/Open as Layers in Photoshop. In Photoshop I select all my layers by clicking on the bottom layer and shift+clicking the top layer and go to edit/auto-align layers. Depending on your image, you will probably want to leave it on Auto, and if you don’t know the quality of your lens “vignette removal” might also be helpful to eliminate any darkness around the edges of the frame. This process will stitch the images together into a taller, larger, but awkward image. To eliminate this, you’re going to have to spend some time adding layer masks to the image to reveal the layers of the photograph until they merge into one. There’s no way I’m going to teach you how to mask layers here, my greatest resource has been Scott Kelby’s Adobe Photoshop CS5 Book for Digital photographers or Photoshop User Magazine which you get when you become a member of NAPP, the internet and, of course, lots of playing around, trial, and error. Admitedly, I still had a lot of small tweaks to take care of: straightening the image, correcting the warp, getting rid of my nasty light-switch on the wall and other random blemishes that only the lens can find. I ended up moving Alex over a bit since the ladies blocked the rear flashes the wall was darker than the rest of the images and I had to do a more careful job of masking him out of the photo. I re-imported a final .tiff into Lightroom to do some more tweaks, add vignette, and export to .jpeg for distribution to the masses. Hopefully I was able to explain, clearly enough, how to do this yourself. A few key points I want to make here is that it absolutely doesn’t matter what camera you use, or if you have big expensive lighting systems; in fact, I think I might have done BETTER with a point and shoot camera’s increased depth of field at similar settings. What matters is your creativity, and use of a tripod or similar device to stablize your camera to take multiple exposures. Many use this to remove objects from the frame, where it makes them look like they’re floating: Take a picture of you on a chair, take a picture with the chair removed: blend & mask out the chair. Posted on Monday, December 20th, 2010 at 4:00 am. Filed under: Extreme Family, Gear & Tutorials, Portraits Tags: Composite, Elinchrom Quadra, Extreme Family, Family, Ottawa, portrait, Tutorial	RSS 2.0 feed. Justin, this is just awesome! Thank you for sharing your work-flow! SO brilliant! I know I've said it already but I really do love this image! Awesome work Justin!! Wonderful image, and a captivating behind-the-scenes! The end result really conveys a lot of activity. QUICK! Someone please remove the baby from the wall! Such a cute and amazing idea and shot! I love, love, love this photo. The flying baby is the best! Flying baby is indeed awesome! Thanks for sharing the process with us. Very interesting to see how it was done. Finally got around to reading your how-to on this shot, Justin. Thanks for taking the time to show us how it was done! This is, very possibly, the coolest family portrait I have ever seen!